Choose an Addis Prestige Vacuum Jug with 2 litre capacity for a stylish and highly practical container that's great for corporate hospitality. 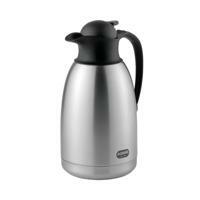 The vacuum-walled design retains heat from hot drinks for up to six hours - ideal for long events. Just tilt and the lid automatically opens to allow easy one-handed pouring. With a strong handle and stainless steel construction, it's built to last and looks great as well.